Our ProManager Management Execution System gives you control over all aspects of your cutting operations. From enquiry & quotation right through to delivery, transport planning and invoicing, ProManager keeps control of what’s going on along with all the associated costs. Information is gathered at each stage of the process and used to streamline later parts of the process. 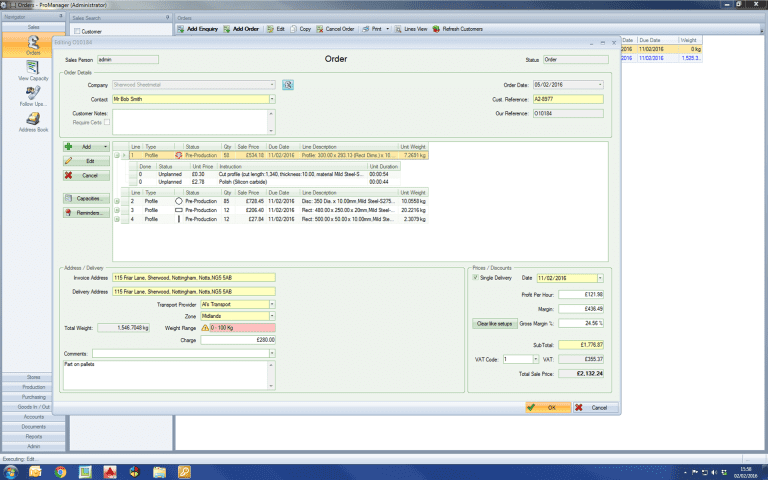 Multiple orders from multiple customers can be nested together producing ultimate flexibility. Post cutting processes are controlled along with all sub-contract operations. Jobs are continually compared in time & cost terms to the estimates used for quotation. The ProManager system is the result of detailed customer research and market analysis. Standard ERP systems are accomplished at managing many types of businesses but cannot take care of many of the specific processes required including dealing with remnant plate stocks, material allocation and the combination of jobs from multiple customers to achieve high material utilisation. Working with selected customers and applying our detailed knowledge and experience has resulted in the ProManager Management Execution System which can take care of the cutting business and all its idiosyncrasies from enquiry to invoice. Configurable to suit large and small operations, ProManager will identify profits and losses by individual order line and facilitate improved control and visibility of the operation. ProManager is a modular application and can integrate with other business systems as required. 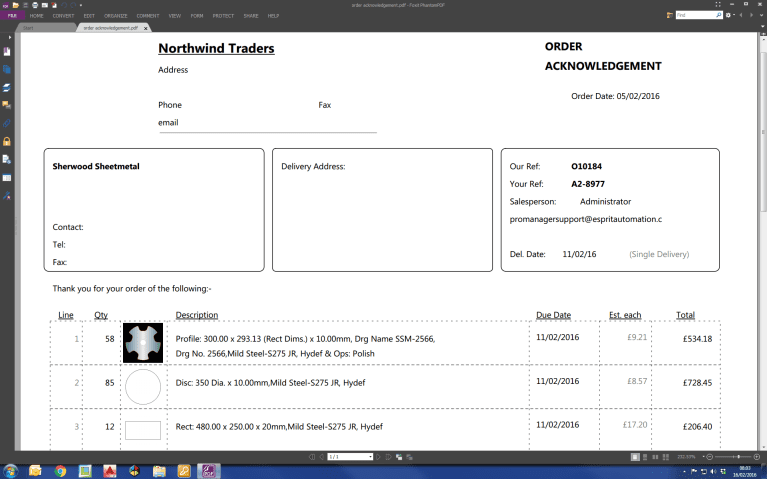 In ProManager quotations or sales orders are quickly entered – in 70% of cases the drawing is completed by the salesperson – either by standard shape or dxf/dwg import. Drawings are managed in the SQL database along with all other data. 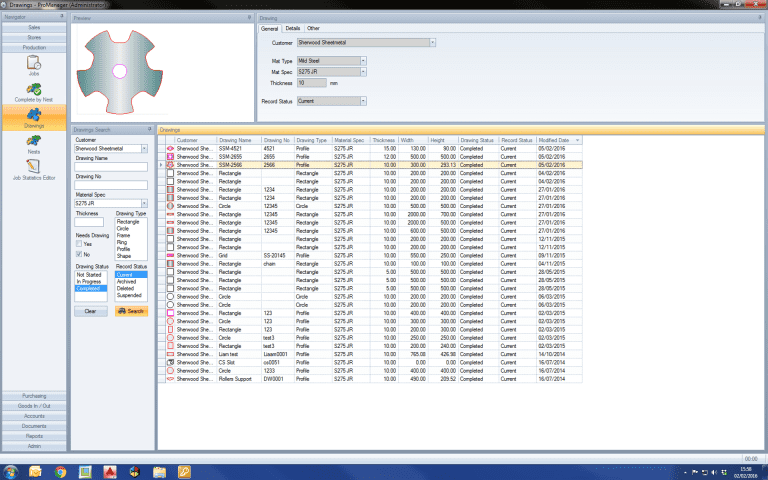 Profile parts & remnant plates are displayed graphically. The materials database stores all the important data about each plate and tracks offcuts until fully exhausted. Plates can be nested onto whilst still on order so that production can start the moment they come into stock. QA is taken care of – plates can be quarantined pending inspection and cast numbers etc. are recorded and tracked. ProManager Management Execution System can be configured to produce a wide range of documents and reports for printing, faxing or emailing. What is a management execution system? A Management Execution System, or MES in short, is an integrated software solution that enables a manufacturing company to closely track and optimize its entire production process. It keeps track of which resources (raw materials, personnel, machine time, storage, etc) are used for what exact purpose, and provides an easy overview and interface for decision makers to assess and optimize the the different steps of the production process. Although a Management Execution System does require an initial investment as well as training of your personnel, its benefits vastly outweigh any and all costs. It provides you with full transparancey and controll over your production process, from enquiry to delivery. The management execution system will identify any inefficient use of raw materials or other resources which might lead to scrap or lost time, and recommend superior alternatives. Thanks to the MES ability to track and optimize your production flow in real time, there is no need for substantial just-in-case inventories anymore. Bottlenecks are immediately identified allowing the production process to be redesigned to maximise those scare production resources, resulting in an overall increased uptime. A management execution system is tracking the production in real time, and will immediately flag any issues or faults in a certain batch. This avoids entire batches being lost. 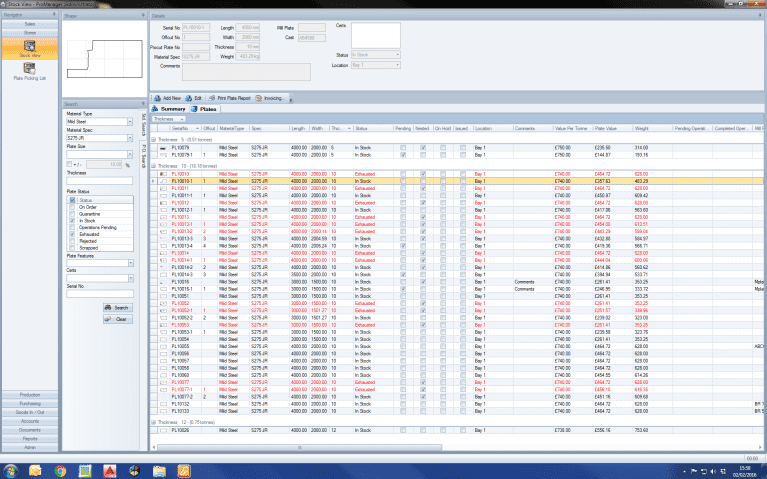 Because the MES is able to track every single resource that goes into a certain process, you will be able to get a more accurate picture of real production costs and profit margins. Did a manufacturing error still occur? Thanks to the MES you will be able to fully trace back every production step of a certain batch, giving you quick insight in where the issue originated. Implementing a manufacturing execution system for the first time can be daunting. Most of your personnel will need to be trained on how to use this integrated software solution, which we understand can seem like a huge barrier. That is why our team of software experts will be there to help at every step of the way. The comprehensive MES onboarding & training of your workers as well as our availability for any follow up questions or issues is all part of the great service we offer. CONTACT US For all your Management Execution Sytem needs.